Sam Querrey reclaims the No. 2 spot by reaching the semifinals of ATP Memphis. Despite dropping a spot, Stevie Johnson continues his strong 2015 campaign with back to back quarterfinal showings at Memphis and Delray Beach Open. Donald Young continues his rise with a semifinal at Memphis and second career ATP final at Delray Beach Open (l. Karlovic). Also in Memphis, Austin Krajicek reached first career ATP quarterfinal losing to top seed, Kei Nishikori, in 3 sets. 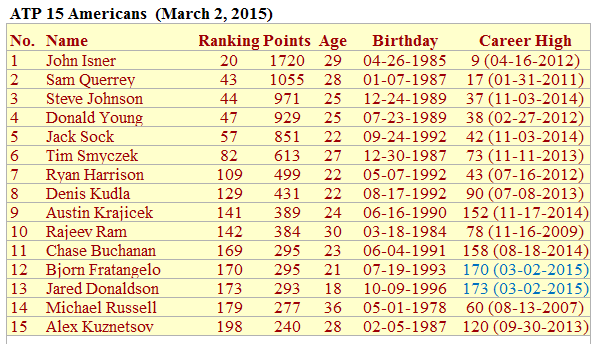 Ryan Harrison jumps 56 spots since the last monthly ranking. The 22 year old qualified and made the semifinals of ATP Acapulco, a 500 level tournament. Along the way, he defeated Young, Grigor Dimitrov (1st Top 10 win in 23 tries), and Ivo Karlovic before falling to World No. 9 David Ferrer who went on to capture the title. Harrison attributes his resurgence to the rehiring of coach Grant Doyle and the mentorship of Andy Roddick. Tim Smyczek reenters the Top 100 by lifting the title at the $100K Challenger of Dallas taking down fellow American Rajeev Ram. Bjorn Fratangelo makes his debut on the list, coming in at No. 12, after winning maiden challenger title in Launceston, Australia. The 2011 Roland Garros Boys champion defeated talented 18 year old Hyeon Chung of Korea in 3 sets. The Bryan brothers won their first doubles title of the year, 104th overall, in Delray Beach. Bjorn Fratangelo takes over the top spot, competition is heating up! Bradley Klahn underwent recent surgery and will likely be out for a while. Rhyne Williams re-triggered disk herniation in his back and will also be out. Jack Sock was set to return from hip surgery in Memphis but did not. Will probably return in Indian Wells. On the brighter side of things, Harrison's brother, Christian is a "month or month and a half" away from playing. The 20 year old is returning from double-hip operations. Daniel Kosakowski is back on the court. The 23 year old had multiple surgeries the last two years. 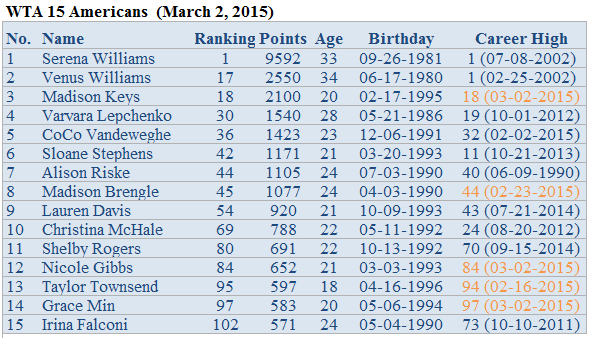 After closing in on the WTA Top 10 in January, Venus Williams drops back down to No. 17 for not successfully defending the Dubai title. New career high for Keys, Brengle, Gibbs, Townsend, and Min despite minimal playing/results since the February ranking. After back to back first round wins in Rio De Janeiro and Acapulco, Bethanie Mattek-Sands is close to returning to the Top 200. As pointed out by Ian Quattrini (@ilq01258), Raquel Kops-Jones and Abigail Spears make their Top 10 debut in the doubles at No. 10, thanks to the final appearances in Doha. Congrats to the ladies. Louisa Chirico made her first $100K final in Midland. The teenager also qualified for her first WTA tour event in Acapulco. The combined showing propels the 18 year old to a new career high of 145, moving her up the list two spots to No. 7. 15 year old CiCi Bellis won her 1st $25K of 2015 today in Rancho Santa Fe (d. Maria Sanchez), but it won't be accounted for until next week. With the win, she is closing in on Top 200. Jamie Hampton has not yet decided when to return to the WTA tour. Christina McHale was supposed to return this week in Monterrey but withdrew. Coco Vandeweghe retired in Dubai and is currently nursing a shoulder injury. Madison Keys has yet to play since Australian Open after struggling with injuries there. What do you think is Steve Johnson's peak? Sorry for the late reply, haven't checked the blog since my last post. I'm going to say Top 30 unless I see a big improvement in the backhand.